Children have a vivid imagination, and facing the unknown can be scary. Whether it’s the scary imaginary monster in the closet or the first trip to the dentist, the way we respond and the example we set can make a big difference to how a child feels. Many children, (let’s be honest, many adults too), have a hard time going to the dentist. We can, however, make things a great deal easier by contributing in a positive way, in the hope of fostering a great relationship with excellent oral care, setting our little-loved ones up with happy teeth for the future. We have to be very careful of the impression we give our children, especially if we are a little afraid of the dentist ourselves. Kids soak up everything, so try to avoid making absent-minded comments about any negative dental experiences you may have had. Try to keep your attitude to your own dentist trips calm and positive, avoiding the use of scary words like pain and hurt. We need to be honest about what to expect but we can create a less intimidating impression by choosing a different language; such as that it may feel strange or a bit uncomfortable, or that sometimes it can feel like a cold sensation. We can help our kids understanding by explaining that a dentist is like a doctor just for our mouths. It’s their job to make sure that our gums and teeth are healthy and strong so that we can keep eating our favourite foods, feeling healthy, whilst avoiding problems in the future. We can express that the dentist is someone that we can trust to guide us on how best to look after our teeth and our smiles. 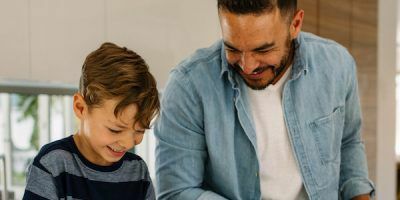 You can guarantee that your child’s greatest role model is you, so showing that your teeth are important to you every day is a great way to instil the idea that our teeth are worth investing in. Try brushing your teeth together, encouraging them to look at their teeth in the mirror, and show them yours too. If you have any fillings; explain that dentists do this as a preventative measure to make sure our teeth last and feel good. Express your gratitude for having a great dentist to take good care of you! Try not to launch into a Dentist trip as a surprise attack as this could be very stressful for your little one. Instead give them some time to mentally prepare and ask questions, all the while carefully choosing the responses you give by focusing on honest, but positive and practical answers. We can express that the dentist is someone that we can trust to guide us on how best to look after our teeth and our smiles. Sometimes a role-playing exercise can put a young mind at ease. If you have a chair that leans back you can get them to sit in it so they know what it feels like. You could even lean the front seats of your car right back and both sit like that together to create a fun memory they can connect with leaning back in that way! When you talk about the equipment the dentist uses don’t be too specific but use words like cool and clever to build positive associations in their mind. There are many great children’s books about going to the dentist that can help your child normalise the experience ahead of them. A couple of great examples include ‘Just Going To The Dentist’ by Mercer Mayer and ‘Show Me Your Smile! : A Visit To The Dentist’ from the popular Dora The Explorer book series. There are a few tools and tricks we can employ to shake off any nerves. We can try telling a story or playing a game on the way to the Dentist and in the waiting room. We can take a beloved toy or soft comforting blanket along for a soothing familiar touch. We can encourage our child to play pretend while they are at the Dentist, imagining what their favourite brave superhero or cartoon character would feel when they visit their Dentist! Spider-Man would be sure to take it in his stride! Praise and kindness are invaluable tools for building confidence in your child so it’s important not to underestimate the difference you can make! Let them know how proud you are when they are brave, and be gentle and nurturing if they feel scared. Pushing them to be tough will contribute to stress, so focus on being patient and positive. It might take time for some children to overcome their anxiety around Dentist trips, but your calm example will go a long way to enforcing the message that the dentist is a friend and not a foe.